Want to kick it in the Premier League? 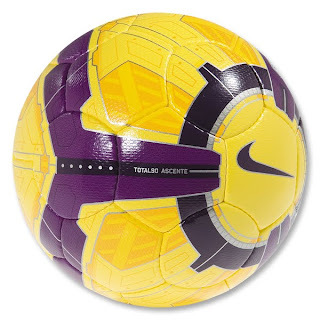 Then check out the Nike T90 Ascente Hi-Vis Premier League Soccer Ball! Nike spent two years working on this amazing soccer ball, with the aim of making our game faster. The high-visibility version of the Ascente EPL is easy to track during match play. The power from your foot is distributed evenly around the ball for a consistent, accurate and powerful strike no matter where you kick it. In other words, the Ascente has a 360-degree sweet sport. Bonus: The design and color make it easy to follow down the field. The Cover: Compressed polyethylene absorbs energy and releases it at launch (aka. it flies off your foot). Micro texture on the cover improves control. LINING: A cross-linked nitrogen-expanded foam backing ensures shape retention and a polyester support fabric creates durability. The Bladder: Six-wing carbon latex for explosive acceleration. FIFA approved.